PennsylvAsia: Japanese-American detainees to "feel the warm friendliness of the people of Pittsburgh"; papers tell story of wartime Japanese-American relocation to Pittsburgh. Japanese-American detainees to "feel the warm friendliness of the people of Pittsburgh"; papers tell story of wartime Japanese-American relocation to Pittsburgh. The archives of local newspapers trace the brief history of Pittsburgh's involvement in the imprisonment and forced relocation of Japanese-Americans during World War II. These articles show that an old orphanage on Perrysville Avenue in Perry North doubled as a temporary home for Japanese-Americans forced out of their homes elsewhere. It was a source of some controversy, mostly because neighbors were afraid Japanese-American laborers would damage property values, though the program of incarceration and forced relocation ended before Pittsburgh could fulfill its potential as a home for 100 to 200 families. PITTSBURG [sic], Pa. - Wholeheartedly endorsing the program to assist evacuees in getting established in Pittsburg, a group of 40 leading residents met in the Western Pennsylvania Committee on Resettlement, the War relocation Authority disclosed. Among the committee members were representatives of labor, industry, social and welfare agencies, governmental bureaus and churches of several denominations. Also a member is the wife of the mayor of that city. Out come of that meeting was the appointment of a nominating committee which was empowered to formulate sub-committees on housing, public information, community participation and employment. Copies of that publication are available from the Densho Digital Archive. Based on what would follow, it looks like aiding Nisei was not on the minds of the gathering Pittsburgh citizens. A movement has been launched to bring some loyal Japanese-Americans into the Pittsburgh district. Backed by the Executive Committee of the Council of the Churches of Allegheny County, the War Relocation Authority plans to open an office here soon. Employers who want to hire Japanese-American workers will apply at this office, which will contact relocation centers where the eligible Japanese - Americans are quartered and try to recruit men or women there to meet local needs. A committee of community leaders is formed to assist the WRA in obtaining housing facilities for the evacuees, and in making them a part of the community. Two days later the Pittsburgh Press wrote "Relocated Nisei Aid War Effort", saying that Japanese-Americans from the west coast "have aided the war effort in cities with industries similar to those of Pittsburgh". Regional WRA officials now are planning to establish a Pittsburgh office, backed by the Executive Committee of the Allegheny County Council of Churches, to receive applications from employers who want to hire Japanese-Americans. Pittsburgh is the last big city away from the Pacific Coast to start a relocation movement and all relocated Nisei in Pennsylvania are now in the eastern part of the state, totaling 430 in all, with 262 in Philadelphia and 26 in Swarthmore. Others are in rural and semi-rural areas. WRA said the available evacuees include mechanics and factory workers, as well as skilled truck farmers and hotel help, and that many of the Jap-Americans, whose loyalty has been checked with FBI and other Government agencies, are used to machine operations in industry. The War Housing Authority today had asked Pittsburgh to swing an "open door" to the residence of Japanese-Americans in the city from relocation centers in which they have been restricted for the last two years. According to Robert M. Cullum of Cleveland, representative of the War Relocation Authority, approximately 60,000 of the Nisei---second generation Japanese---are free to leave the relocation camps now with nowhere to go "and the necessity has arisen to spread them throughout the country." Mr. Cullum spoke to a meeting of nearly 50 persons in the Roosevelt Hotel at which a Citizens Committee was formed to help loyal American-born Japanese to establish residence and find employment in Pittsburgh's industrial plants. Expressing his confiction that the people of American will see the problems of the Japanese-Americans "in our light," Rev. [Shunji F.] Nishi said, "Americanism doesn't depend on your color or the slant of your eyes, but on the color of your thinking and the slant of your ideas." Dr. [A.B.] Kinsolving [of Calvary Episcopal Church] stressed the point that prejudice is always worse than the thing it is directed against and urged that the Citizens Committee do everything possible to fight off this prejudice, aide in obtaining housing facilities for the evacuees and in making them a part of the community". Officials of the War Relocation Authority and the Pittsburgh Citizens' Resettlement Committee yesterday stood firm in their plans to house loyal Japanese-Americans at the Gusky Orphanage. The proposal had been protested by a group of Northside residents. "We will continue active participation in seeing that those in this group of loyal Japanese-Americans who choose to come to Pittsburgh will have their constitutional rights preserved and feel the warm friendliness of the people of Pittsburgh will be extended during their stay in our midst," the committee declared in a formal statement. Gusky Orphanage was out of service in 1945, having closed in 1943. In 1950 it was razed, and in its place today stands the campus of the Byzantine Catholic Seminary on the corner of Perrysville and River View Avenues. Like the north central area, the Great Lakes area, including the States of Michigan (excluding upper peninsula), Ohio, Kentucky, West Virginia, the western part of Pennsylvania and the western part of New York, offered excellent opportunities for resettlement of Japanese Americans. Employment offers were plentiful and community acceptance was present from the beginning. Instances of discrimination and prejudice were few in number and not important, and in no case did they represent the attitude of any appreciable segment of the community. In one case, in Pittsburgh in June 1945, a controversy was touched off by a press announcement that a vacant orphanage had been donated as temporary quarters for a hostel. A small group of residents of the neighborhood held a protest meeting, circulated a petition, and tried to get an injunction to prevent use of the orphanage as a hostel. The case was dismissed with the ruling that "common pleas court had no jurisdiction in the matter." During the summer, while court action was pending, the hostel was used without incident. It had also been learned that only 36 residents of the ward had signed the original petition, although the population of the ward was 24,982. The 26th Ward Citizens Committee today made good its threat to take court action to keep Japanese-Americans from being quartered in the old Gusky Orphanage. The committee filed a bill in equity in Common Pleas Court, charging presence of the Nisei would be "detrimental" to the neighborhood, and would "depreciate" property values. The bill asked that legal costs be assessed against the Pittsburgh Committee for Resettlement of loyal Japanese-Americans. The action climaxed a controversy that developed when the War Relocation Authority announced plans to bring more than 100 Nisei here. The WRA, and its supporting Pittsburgh committee, said the old Gusky Orphanage on the North Side was the only "suitable" building to be found. The 26th Ward Committee today denied the building was suitable, and said its use would violate a zoning ordinance forbidding large multiple-unit dwellings in the neighborhood. Yes, imagine using an orphanage as a "large multiple-unit dwelling". As we find in that article and in others around the same time, nothing approaching the 100 Nisei ever made it to the Gusky Orphanage. Actually, accounts from July 1945 only put two families there: a family of nine and a family of 12. The first didn't arrive until August 18th, and the second on August 19th. The second---the Fujihara family---was out the next day. "Jap-Americans Quickly Find Work on Farm", was the Pittsburgh Press headline on August 20, 1945. The twelve Fujiharas, who left their rich California acres when the war began, were tilling the soil again today. This time it was Western Pennsylvania earth, and it didn't belong to them, but they were back at the work they loved after three years in a concentration center for Japanese aliens and Japanese-Americans. The Fujiharas moved into the Gusky Orphanage on the North Side yesterday and left this morning for their new home on a farm ten miles north of Titusville. Expert truck farmers, they had their choice of at least 20 good farm jobs, said Dr. Howard E. Mather of the War Relocation Authority. Only one other family--the Ishimotos--is still quartered temporarily at the old orphanage, and Dr. Mather expects this family will be placed within a day or two. Only a few Japanese-American families are expected to come to this district before the end of the year, when all the relocation centers are closed. About 60 percent of them eventually will return to their shops and farms on the West Coast, Dr. Mather estimated. More about the Fujiharas later. The controversy about housing them at Gusky continued after the families arrived, says an August 19th Pittsburgh Press article that picks up from the July 5th story quoted above. Judge John P. Egan yesterday [August 18] refused to issue a special injunction asked by the 26th Ward Citizens Committee after a family group of nine was brought to the old Orphanage building late Friday night. The Resettlement Committee's victory was only temporary. Judge Egan refused the injunction on technical grounds. The big [Fourth of July] parade did not stop in the North Side last week as promised and they are still sore about it over there. But they are sorer because someone wants to house Japanese in the old Gusky Orphanage. At a mass meeting it was claimed this would hurt property values--just about the poorest excuse that could be offered for bringing our country's enemies into our neighborhood to undermine our morale. If the Japs had their way there would not be any property values at all; like Tokyo and other Jap cities today. A June 26th Pittsburgh Press editorial answering the question made by a local representative, "The Japs are mostly to work on farms, so why put them here?" The obvious answer is that they have to be housed somewhere until permanent places are found for them and the orphanage building seemed to meet that need. It has been emphasized by representatives of the Government agency that they are not to be kept there for any considerable period of time, nor are they to be permitted to settle en masse in any locality of the country. They will not be herded together into a confined district where they would be unwanted and unwelcome and invite the label "Jap-town." It is the purpose of the Relocation Authority to help them find jobs and homes nearby, scattering a mere 200 among 1,400,000. Much larger numbers have been placed in Cleveland, Chicago and other cities. It would be a sorry reflection upon Pittsburgh if it should refuse co-operation in this very modest program. The Northside isn't being picked on. It just happened that the old Gusky building seemed to meet a pressing and temporary problem. The zoning question would probably never have been raised if the families involved had not been of Japanese origin. We haven't hesitated to enlist their sons in the army where they have fought side by side with our own. One of the first and most emphatic protests against unfair treatment of the Nisei came from GIs, through the "Stars and Stripes" [magazine]. If we can't take a minor matter of this sort in our stride we had better stop talking about tolerance and broad-mindedness and fair play. If we believe in them only for the other fellow we might as well stop pretending that we believe in them at all. I have just read the reports on the proposed housing of Japanese-Americans in the Gusky Home. I no longer live in the 26th Ward but I did go to school there and I lived there until my marriage, so I feel free to give my opinion on this subject. These Japanese-Americans have been proved loyal to our country--and it is theirs, too. They are citizens, but they have had a bad time these last couple of years. Now they desire a break and it is up to all of us who have been more fortunate to see they get it. We, through our Government, were responsible for taking them from their homes and placing them in camps. Now it is up to us to help put them back into homes and help find ways of earning a living. After all, my forefathers came from Germany and we have been at war with Germany. The loyalty of these people has been questioned and they have been proved true. We owe them an apology as well as a helping hand. I realize that the people of Japan deserve whatever our boys do to them because of their actions toward us and the other countries of the world. My husband is in the service to fight them so I have reason for hating them. But please remember this--there are good and bad mixed in every nationality. These people or their forefathers came here for the same reason ours did. Why should we deprive them of the right to live in our city just because they happen to be of Japanese descent? 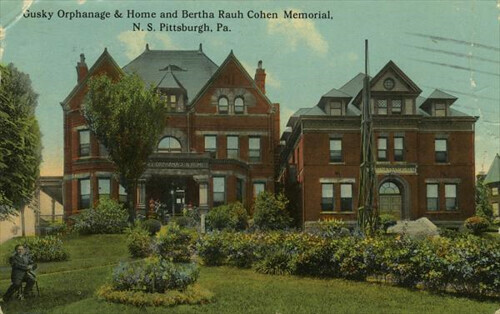 Beulah Kennard of Pittsburgh writes on July 16 of being "shocked and distressed by two recent reports, showing an apparent lack of generosity of spirit in which we have always taken pride". One report stated that a Northside committee in our own city had "protested" the temporary lodging of some selected American citizens of Japanese parentage in the Gusky orphanage. Apart from the lack of kindness which such a protest shows, these Northsiders seem to be ignorant of the fact that this is a peculiarly bad time to express racial prejudice and antagonism because we are playing right into the hands of the Japanese warlords. They know they have lot the war, but they hope by prolonging it to gain a softer peace; and one of their arguments is our hatred of the Japanese people which makes even suicide seem better than surrendering to us. Every expression of dislike on our part is exaggerated and distorted to this end, and we must not forget that Japan is no longer on the other side of a wide ocean. She is only 36 hours away by plane and scarecly 10 minutes by radio. The last one includes long excerpts from an email exchange between Warner and Aiko---one of the daughters---and Kenneth---one of the sons. Rather than quoting something out of context, it's better to read Warner's three pieces in their entirety. Pittsburgh's participation is unremarkable; as an article said "Pittsburgh is the last big city away from the Pacific Coast to start a relocation movement" and as one of the most important cities in the country at the time it was to be expected. Volumes have been written about Japanese-American internment so it isn't necessary to editorialize here. It's just interesting to stumble across these accounts, and to add texture to an era we've grown to mythologize through both media and our grandparents. There was some overflow when collecting these articles, and including some sources would have made the post even more long and unwieldy. Look for more in an upcoming installment a little later.